Elberta German Sausage Festival in Elberta, Al. Für Das Gute Leben! These words welcome visitors to the small town of Elberta, Alabama, and they describe it perfectly. Für das gute leben means “for the good life”, and this weekend over 30,000 people are expected to be in town to enjoy some of the good life for themselves. The German Sausage Festival will begin at 10:00 a.m. on Saturday, March 26th, with food, music, and fun in store for all of the attendees. As if the great food and music weren’t enough, over 200 arts and crafts booths will be open, with something for everyone. And for the kids, there’s a children’s area, complete with carnival rides and face painting. For more information about Elberta’s German Sausage Festival, CLICK HERE. 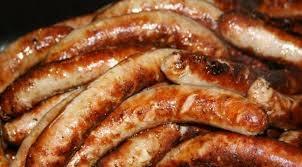 So, join us for the Sausage Festival and see what the good life is really all about. And remember, you can live here, too!